The first thing I saw when I went online this morning was a headline about the passing of David Bowie. I then spent the next several minutes clicking through links, hoping to find one that said it was a hoax. It wasn’t. 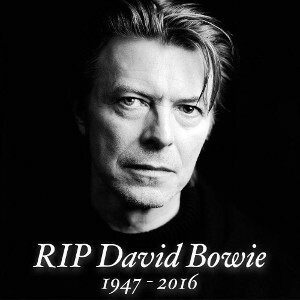 David Bowie passed away Sunday, January 10, 2016, after an 18-month battle with liver cancer. He was one of the most influential artists of the past forty-odd years, with some more odd than others, and he will definitely be missed. At my age, I have seen more celebrity deaths than I can count, we all have, but there have been a few in my life that hit home, that struck a special chord for me, as an individual. When John Lennon died, I knew there was something seriously wrong in the world. When Steve Clark died, I knew that sometimes the demons win. When Freddie Mercury died, I knew that sometimes the show doesn't go on. When Criss Oliva died, I knew that it's not always in your own hands. When Robin Williams died, I knew that sometimes the brightest souls conceal the saddest hearts. When David Bowie died, I knew that even beauty wasn’t immortal. We all must go, but what a difference we can make before we do. While I was certainly aware of Bowie earlier, my first engaged experience was with the music video for Blue Jean. I was twelve years old, and Bowie’s grandiose performance was like nothing I had seen before. Then I saw Ziggy Stardust, and learned what grandiose really meant. I don’t remember for certain now, but the movie must have been playing on late night TV somewhere. That is usually where I saw obscure, music-related movies. All I do know for sure is that I was fascinated. I wanted to be Ziggy for Halloween, but could never quite make it work. By the time I saw Bowie’s spectacular turn as Jareth the Goblin King in the 1986 cult classic Labyrinth (which would quickly become one of my favorite movies), I’m afraid that was how I believed Bowie to be. I had, by that time, completely lost track of the difference between Bowie and his various and wonderful characters. The Thin White Duke had fallen to Earth and, in the process, become something so much larger than life. I’ll be the first to admit that I was an impressionable child, and the over-the-top fantasy elements of Bowie’s performances during that period were a definite attention-getter for me, but that was only the beginning. Thankfully, I had friends who had a much deeper knowledge of music than I had at the time, and I was quickly introduced to such classics as Space Oddity, Young Americans, and The Man Who Sold the World. The music was amazing, and I was fortunate that my discovery of Bowie just happened to be timed with a resurgence in his popularity. It was a great time to be a David Bowie fan. with hits like China Girl, Let’s Dance, and the wonderfully fun Magic Dance (from Labyrinth). To make things even more fun, it sometimes seemed that Bowie was doing duets with everyone during this time, so we got Under Pressure (with Queen), Tonight (with Tina Turner), Dancing in the Street (with Mick Jagger), and the one my Christmas is never complete without, The Little Drummer Boy (with Bing Crosby). He was an icon in music, but Bowie became a cult favorite on the screen as well. Having begun his musical career with characters like Ziggy Stardust and the Thin White Duke, it was no surprise that Bowie would also branch out into acting. He started early with the documentary/concert movie for Ziggy Stardust and the Spiders from Mars (1973), and then followed with the similarly-themed The Man Who Fell to Earth (1976). A series of small parts followed, including the Jazzin’ for Blue Jean (1984) that so caught my attention, and then Labyrinth (1986) happened. From that point on, Jareth the Goblin King would be forever remembered as one of Bowie’s beloved characters. Today when people think of Bowie and movies, Labyrinth tends to be one of the first things people mention, but he didn’t slow down there. My personal favorite was his portrayal of Nikola Tesla in The Prestige (2006) but, if I remember correctly, that was also my favorite movie of that year. It’s definitely one to go back and watch again, whether for Bowie or otherwise. David Bowie didn’t just redefine a genre. He was a genre unto himself. From psychedelic space odyssey to plastic soul, from electronic to new wave, from classic to contemporary, David Bowie reinvented himself over and over again, and reinvented the music every time he did it. He did it all, and he did it all well. With his passing, the music world has lost a legend. This is my small tribute to that loss, just reminiscing on some of what meant the most to me. To be honest, I can see David and Freddie Mercury getting together right now to plan out some new jam sessions. Can you imagine how that would sound? David Bowie has been lost to the world, but his music and his legacy will live on. The Man Who Fell to Earth has moved on again, and we are the poorer for it, but the treasures he left us with are a wealth that cannot be defined. "It's only forever. Not long at all." You will be missed, Mr. Bowie. David Bowie left us with a last gift, his final video for the new song Lazarus. As always, all copyright belongs to Bowie. Wherever he is now, you can bet it isn't boring.